If you have a baby, one thing that is extremely useful and essential is a diaper bag. It is a type of bag designed to carry all the essentials for a baby like bottles, napkins, pacifiers, clothes, toys, and other similar baby accessories. Diaper bags have traditionally resembled tote bags that you can carry on your shoulder or hang to the stroller. They are typically large in size and have a lot of pockets inside and outside where you can fix and organize stuff. However, more diverse diaper bags are now available, and they can also be worn as a backpack. Baby backpacks make sure that when you are heading out of the house, you have everything in one bag that is effortless to carry. These are essentially designed as a diaper bag from the inside but on the outside look like a backpack with extra shoulder straps. Also, the prints and designs are more sophisticated as opposed to traditional diaper bag prints that usually are too colorful and have cartoonish prints. If you are a mom who is searching for such kind of diaper bag, this article can help you a lot because it will evaluate one diaper bag that has just been launched in the market. Read ahead to learn about its features and what makes it different from the many diaper bag options online. The Chic Mommy Baby Backpack Diaper Bag is a 2018 model that is designed for today’s mom since it has a modern look. This is not merely a backpack or a diaper bag, but it can be carried in different ways as well. It can be a tote, a messenger bag, or a stroller organizer. The Chic Mommy Bag is a versatile, lightweight, and stylish tote backpack that has enough capacity to hold your personal items, as well as your baby’s essentials. As a backpack and stroller organizer, it comes quite handy since you may need both your arms to tend to your baby or toddler. It is also a sturdy bag both inside and outside as the material used in its construction is quality. Hence, you can keep all your baby’s stuff and even yours without worrying about ripping the fabric. The manufacturer also recognized the fact that diaper bags are prone to dirt and spills that is why they really made sure that this product has a waterproof exterior. This also ensures that your bag remains a breeze to clean or wash. Although this bag is easy to carry around, the straps have not been padded enough that might cause shoulder pains when you put too much stuff in it. Nonetheless, you always have the option to hold it using the handles or hang it on the stroller. This bag also has pockets in front for you to access items that you regularly need, like wipes and tissue rolls, easily. However, when wearing it on your shoulders or back, you might want to avoid putting anything fragile in these pockets. This product is also integrated with feeding bottle pockets on both sides. What is better is that the manufacturer of Chic Mommy Bag assures you of its quality since they offer a warranty, replacement, and money-back guarantee deal. A stylish and easy-to-carry backpack as a diaper bag is a hot trend now and is quickly catching up with moms who want something functional but also good looking. That is why in this category, new models are popping up every day, and you can find a decent variety. Hence, it is but wise to compare the Chic Mommy Bag with another diaper backpack for you to choose better. 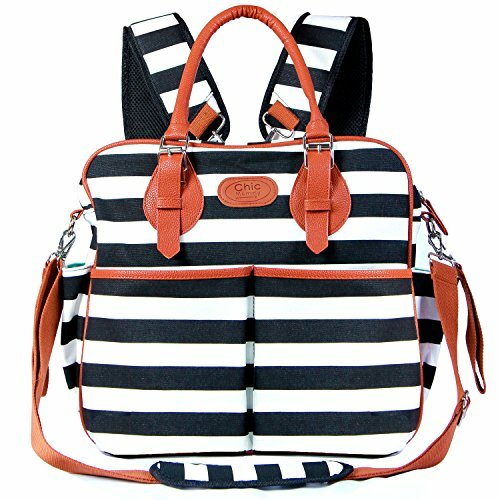 With that in regard, the Yaagle Diaper Bag Backpack is a product that we consider somewhat similar to the Chic Mommy Bag. It can also be worn not just as a backpack, but also as a shoulder bag, a handbag, and a stroller organizer. In addition, it also has side and front pockets, but the one in front has a zipper and has a compartment that is waterproof. However, unlike the Chic Mommy Bag, the whole bag is not waterproof. The two bags also differ in their overall look since the Chic Mommy Bag has a somewhat square-like shape, whereas the other is elongated. The other differences between these two diaper bags or backpacks are that the Yaagle model has more designated pockets. Further, it has a tin-foil pocket for keeping the milk bottles warm and insulated. Additionally, although the Chic bag is a little pricier than the other product, the Yaagle bag only comes with a two-year warranty as compared to the lifetime offer of the other manufacturer. The Chic Mommy Backpack is a modern, all-weather, and flattering diaper bag that is just as functional as it should be but looks nothing like those common diaper bags. It has all the qualities one could look for in such a bag. Those who live in a metropolis and have to walk a lot will find this backpack very reliable because you can just put it on and go about running errands with your baby. It is reasonably priced and is a good value for money since you can still use it as a personal backpack or tote when your child is already all grown up.